Our friend, G, had the great idea to start an X2 book discussion. We’ll be doing 2 books: the first (this one) by a Christian who became an atheist, the second is about an atheist who became a Christian. 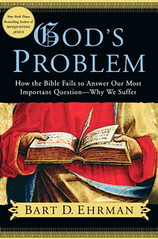 So, read God’s Problem by July 9th and prepare for a lively discussion and more info on the next book. Thanks, G! Anyone up for a group discussion of Bart Ehrman’s book, God’s Problem? Bart Ehrman was raised a devout Christian, spending an extensive college career devoted to the Bible and training to become a minister. After serving for some time in various churches he found himself becoming more and more conflicted about how the Bible (and the Christian tradition) tries to explain why people suffer. -don’t worry, God will eventually make right all that is wrong with the world. Ehrman’s conclusion is that,if there is a God, he could be either all powerful but doesn’t care, or all loving but unable to help; however, in the face of all historic evidence, he cannot possibly be both. And if, on the other hand, he is too mysterious for us to understand, than it is impossible to make any statements about either his omnipotence or his loving nature. God’s Problem is a defense of that thesis. I realize many of you out there will want to tackle these (blasphemous?) charges right here and now, but please resit the temptation to do that. We will be discussing this book on July 9th, and I would LOVE to hear your responses to Ehrman’s claims, and your own thoughts on how you answer the problem of why people suffer at that time. Now for those of you really disturbed that we are reading a book by a Christian who lost his faith, hang tight. Next month, we will read the spiritual memoir of an atheist who became Christian and has devoted her life to Christ’s work of feeding the hungry. Yay! My books came in the mail yesterday. The way you describe Ehrman’s journey sounds similar to the journey of others I know. When they rejected certain theological claims about God, they ended up doubting belief in God’s existence. This can be the result of a tremendous amount of consideration and care and sincere questing, and we shouldn’t belittle them their decision. But it still seems to me like it does not logically follow. Coming to learn that certain claims about God are untrue should lead a person to change how they conceptualize God. But it doesn’t logically follow that God doesn’t exist. It does mean that the God you believed in, as that God was decribed, doesn’t exist, but it does not mean there is no God. and, oh yeah… I reserved my copy at the library about three months ago… and I am still about 29 holds away from getting it. I finally just bought the sucker! I can’t find the quote… but I thought I heard him refer to agnostics as atheists without guts. (or something like that.) A sort of self depreciating humorous reference to his holding out hope in some sort of divine? hey… where did that smiley face come from? what’s the other book? i’d like to order book at the same time. thanks! hmmm… do I spoil the surprise? well, okay. so you can order them together. The other book is Take This Bread by Sara Miles. Very interesting, G. I heard this guy interviewed on NPR, and it sounds like it will be a fascinating book. I’m excited to read it!